You are here: Home / Adam in the Media / Awards and noms / It all started with a “Shady” tweet! 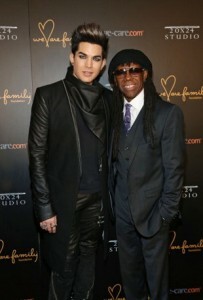 On Thursday night @adamlambert, @nilerodgers and @sam_sparro performed Shady at the “We Are Family Foundation 2012 Celebration Gala 2.0.” It was the first time Niles and Adam (collaborators on Shady) were able to perform it live for an audience. Enough with the talking, on with the performance! I hear he also sung “Whataya Want From Me” but I’ve only found this snippet from the soundcheck. Let me know if you find the entire thing somewhere. This was great! Thank you for posting it all so quickly! It is so heart-warming to see Adam being recognized by such industry icons. I like that he’s burning a steady path to super stardom & not one that will flash too quickly and be gone. He is simply awesome. Love the band, Nile and backup singers. thanks Carol. WOW WOW WOW!!!!!!! SHADY is my favorite on Trespassing and LET’S DANCE is my favorite song by David Bowie. This is the best. Thanks so much for the post and Adam just seemed so comfortable with them and also his acceptance speach.